Dipl.-Ing. Johann Glösmann in Hamburg, Germany. It is 28 years ago now that Salmco has placed its first salmon slicer on the market. dress the requirements of small family-run companies as well as those of large industrial operations. Hamburg-based Salmco Technik is worldwide the only company that produces both cold and fresh slicers for salmon and other kinds of fish. 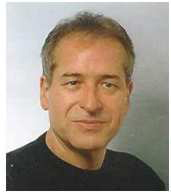 Under the management of its owner Johann Glösmann and his team the company is versatile in other ways, too: Salmco has two further areas of activity in the form of comprehensive consultancy and in the development of complete custom-made solutions for individual companies. The product range offers everything from simple hand slicers to semi- and fully automatic cold slicers and various fresh slicers. The company offers different solutions for different requirements: a specially modified cold slicer combined with a vacuum packaging machine for the complete production of 200g packages for instance; or the newly developed fresh slicer SM 5290 which uses a variable 15° to 90° cutting angle to produce the 'bacon cut' particularly popular in the USA. 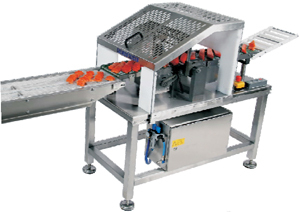 By cutting the salmon fillet into three pieces and placing these crosswise on the conveyor belt this machine can also be used to produce rectangular slices for the catering sector. Small alterations to the machines are sufficient to adapt them to processing species of fish other than salmon, too. The Salmco slicers range from small to middle to large-sized so customers may choose machines to perfectly fit their own production lines. Some producers prefer to have various smaller units in order to achieve a higher level of flexibility. It is a way of reducing risk since - should a machine need down-time - it doesn't mean the whole production-line comes to a standstill. Salmco is active in three areas: the standard range of slicers, the development and combination of customer-oriented machines as well as complete processing lines and, finally, the comprehensive international consultancy. The mostly minor alterations to the standard machines lead inevitably to the second area of activity, the development of individual solutions and complete processing lines. Salmco combines its own fish slicers with machines from other manufacturers whose quality is known and proven and then bear full technical responsibility for the whole line. Salmco the most competent consultant in fish processing matters. Salmco exports to more than 60 countries throughout the world. The company maintains various agencies and, in some countries, cooperation partners. For, in places like Australia, it may take days for a spare part or even a service technician to arrive from Germany. That is why it is so important to us that, in spite of the high level of humidity/moisture exposure in the working environment within the fish industry and in addition to the high mechanical demands made on the machines involved, there should be no break-downs in the first place. And this means that the machines have to be extremely robust, easy to operate and easy to clean. Salmco therefore sets great store in fully stainless-steel design, clear operator control panels with only a few keys and easy accessibility and exchange of all parts of the machines. Application of this philosophy of total quality has made Salmco successful in the market since its foundation in 1984 and has earned the company an excellent international reputation.